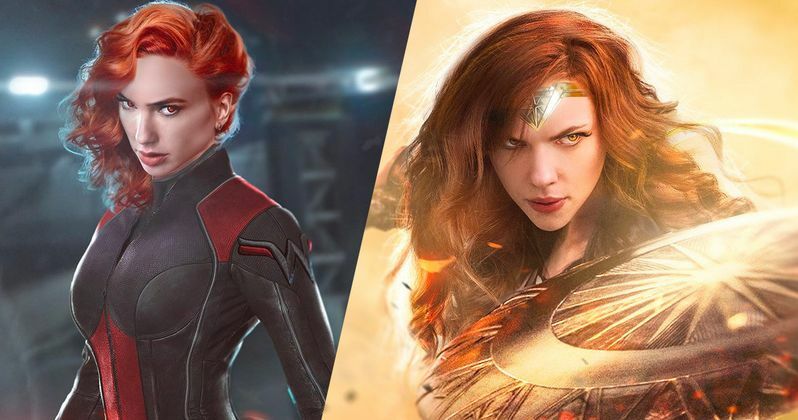 BossLogic imagined what Gal Gadot would look like as the Marvel Cinematic Universe's Black Widow. Obviously, Gadot is the DCEU's Wonder Woman, but the artist is just having some fun. After he posted Gadot as Natasha Romanoff, he posted a new image of Scarlett Johansson as Diana Prince. As with everything else that BossLogic does, the artwork is awesome and contains some pretty crazy detail. With that being said, these character swaps leave an unsettling feeling. Gal Gadot looks good as Black Widow, even with the red hair, but it doesn't look right. However, Scarlett Johansson looks pretty badass as Wonder Woman. Johansson has the right look to pull off the costume, and the artist added a pretty fierce expression to her face, which gives her more of an intense look. Of course, this is all a matter of opinion, and some fans are taking the pictures a little too seriously, when BossLogic is clearly doing these for fun. The artist has had to remind his followers a few times that he's just having a good time. The other set of character swaps that BossLogic completed was Chris Hemsworth as Aquaman and Jason Momoa as Thor. Strangely, these two look pretty good and almost interchangeable, though some fans will disagree. Hemsworth looks like a pretty awesome Arthur Curry and Momoa is a good God of Thunder. However, when looking at their acting styles, it's clear that all of these actors were expertly cast. Momoa is preparing for the release of Aquaman next month, while Hemsworth has a bit of break before heading in to do promotion for Avengers 4. Gal Gadot is currently filming Wonder Woman 1984 with Patty Jenkins. The team is trying to build off of the success of the first installment, and was just delayed to hit a summer premiere date. As for Scarlett Johansson, it has been rumored that the standalone Black Widow movie is preparing to start filming. Additionally, it's believed that the movie is currently in the casting process. From there, Johansson will join up with Chris Hemsworth on the Avengers 4 promotional tour, which will more than likely start a few weeks before the highly anticipated movie hits theaters. Watching the swap of DCEU and MCU actors is pretty weird, but not as weird as BossLogic's Danny DeVito and Thanos mashup that he recently released for the actor's birthday. That's some pretty unsettling imagery right there, though it's pretty intriguing. It's not clear if the artist is going to keep going, but he has a bunch of requests in the comments section from fans who are eager to see more DCEU and MCU mashups. As with anything relating to both studios, there are some interesting arguments being made. You can check out some of the awesome and weird character swaps below, thanks to BossLogic's Twitter account.